As I previously mentioned here, after my first day in Death Valley we decided to go to Rhyolite. 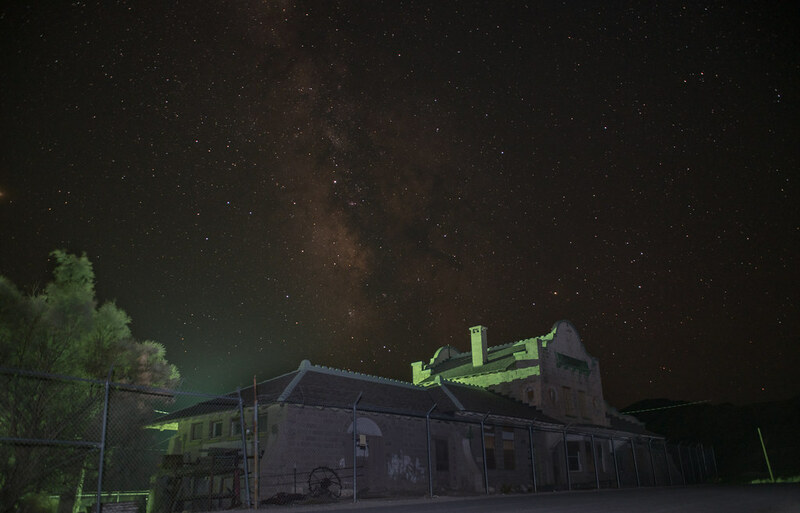 The town of Rhyolite was listed on our map as a ghost town, and so we decided that night time would be the most appropriate time to check it out. 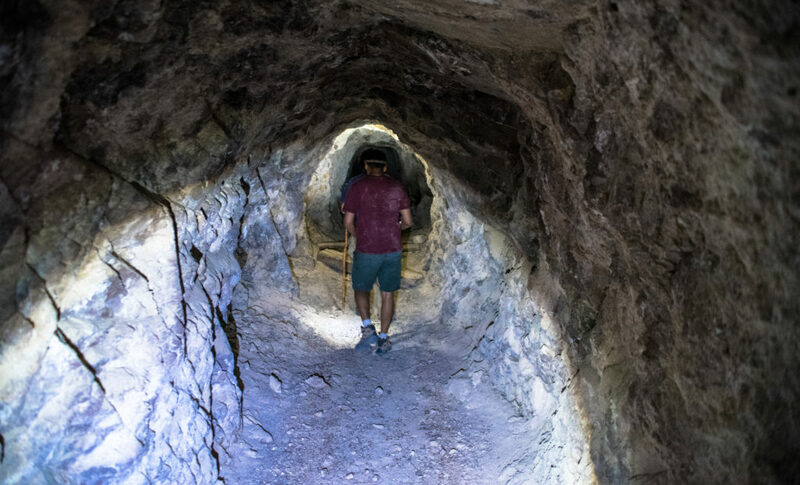 The town of Rhyolite sprung up in Death Valley in 1905 to house some of the many miners that were moving to the area for work. In 1907, the town had electric lights, water mains, a school, and even a hospital. The population was estimated to be in the region of 3,500-5,000. In 1908, the nearby Montgomery Shoshone Mine was found to overvalued. By 1910 it operated at a loss, and in 1911 it closed. By this point the population of Rhyolite had dropped to 1,000. In 1920, it was close to zero. After 1920, the town became a tourist attraction and a movie set. The various buildings were salvaged and gradually destroyed, leaving it as the crumbling ghost town which is now maintained by the Bureau of Land Management. 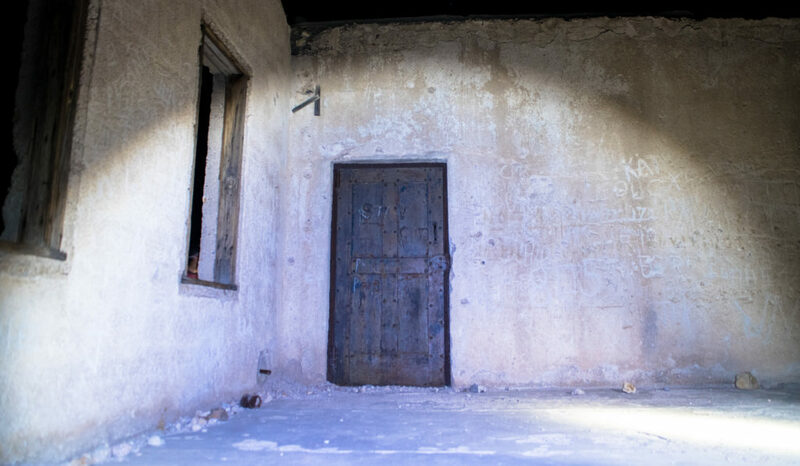 It is reportedly one of the most photographer ghost towns of the West. By the time we arrived, it was already pitch black out. It hadn’t occured to us that ghost towns probably wouldn’t have street lights, but we had at least brought flashlights. From the track running through the town we couldn’t really see a lot, and we had no map of the area (or phone signal to obtain one). 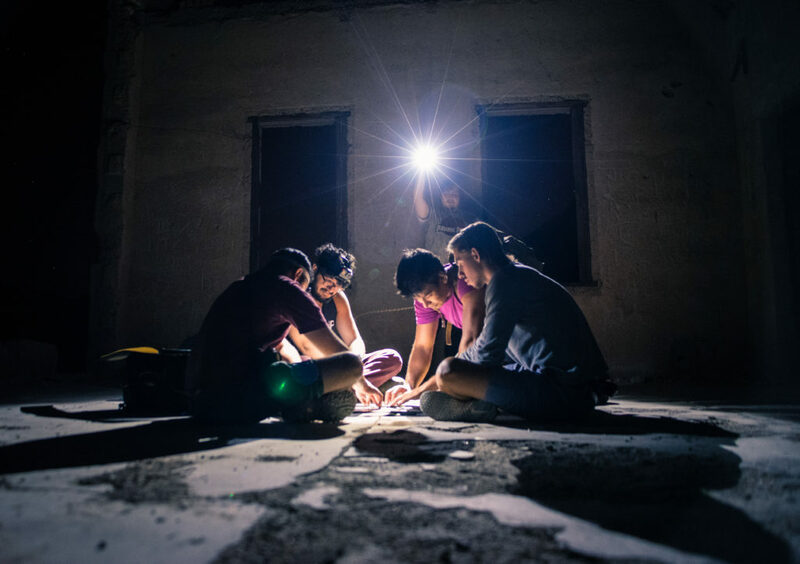 We decided we would just have to pull over and nose around, but as we drove onwards we spotted a group of people with flashlights by the side of the road. We pulled up and I yelled out the window “Are you guys ghost hunting?” As it turns out, yes they were ghost hunting. We asked to join them, they said yes and told us where we could park up. After parking up we walked back to meet our new friends. 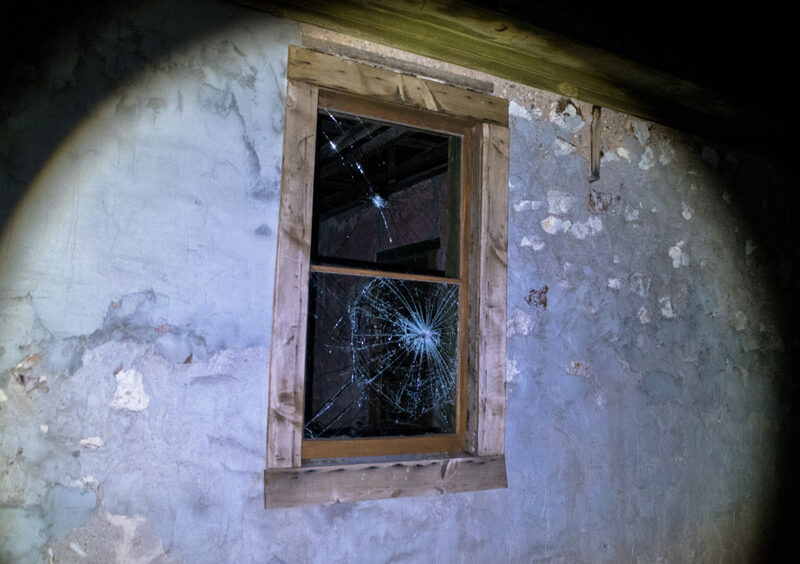 It turns out that this was their second ever ghost hunt, but they were completely decked out. They had several cameras (including a head mounted GoPro), an EM reader, temperature probe, and a Ouija board. They also had guns, as apparently coyotes (and Rednecks) are a real issue in the region, as well as a large stick (to scare rattlesnakes as they walked through brush). These were of course all things that had not occured to us; we were just going to wander around and maybe try and take some photos. First up on the ghost hunt was the old prison. As with most buildings in Rhyolite, this was largely collapsed. All that remained was the prison cells. There was a little window down the side of the cells that could be climbed up to to peer inside, but there wasn’t much to see inside (no apparent ghosts). Since the prison seemed like a good spot to find ghosts, our new ghost hunter pals broke out the Ouija board. The whole attempt was videoed by the ghost hunters, but there wasn’t much to see. Various accusations of each-other moving that planchette, but no actual communications with any spooky ghosts. It was still a pretty novel experience though, even if I did not partake myself. From here we moved on to a small house that remained. The doors were barred and the windows were smashed- generally with what looked like bullet holes. This building was absolutely covered in black widow spiders- there must have been 20-30 of them. Again, this was something that hadn’t crossed my mind at all. I guess I’m a bit too used to roaming the British countryside where there’s nothing really dangerous around at all. We didn’t try and get in to this building because 1. bars and 2. SO MANY SPIDERS. Next stop on our little tour of Rhyolite was the grave Mona Bell, reportedly the only person to die in Rhyolite proper (most deaths occurred in the nearby mines). She died in 1908, shot by her boyfriend (who was incarcerated in the nearby prison for his crimes). 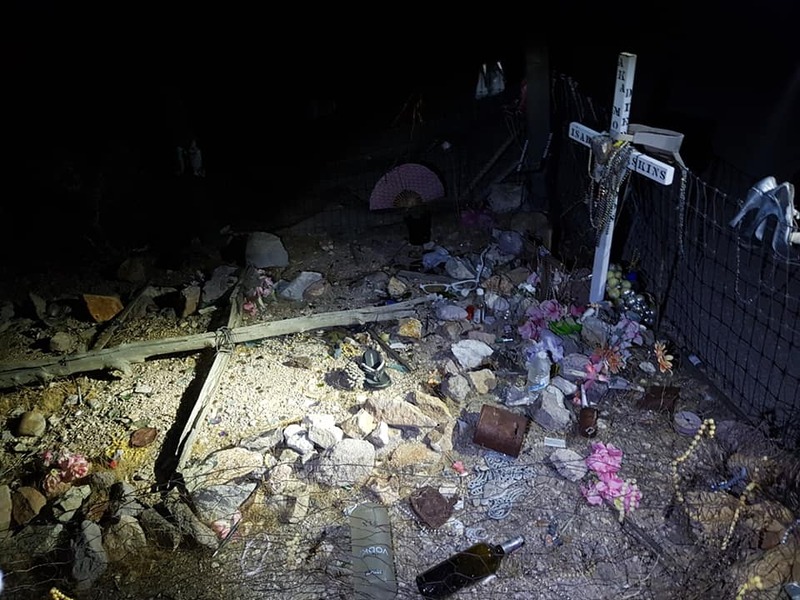 The grave of Mona Bell is littered with offerings; high-heel shoes, alcohol, jewellery, and nick-nacks. Reportedly her body is not actually entombed here- the memorial was set up later on, with her actual resting place being unclear. Once again, there were unfortunately no signs of ghosts here (spooky or otherwise). 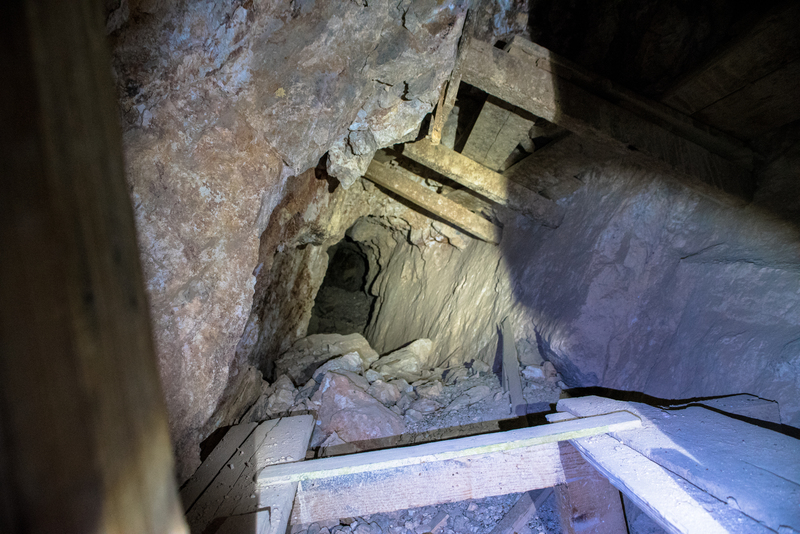 Next up on the tour was the mine shaft at the edge of town. The head of the group beat his way through the brush to it. The time just after dusk is when rattlesnakes are most active he said, and if you get bit in as remote a place as Death Valley you will most likely have a very bad time. When we got to the entrance to the mine (unbitten), we found a heavy metal gate blocking the entrance. However, it seemed that we were not the first parties interested in the mine- the area under the gate had been dug out so that one could slip under it. Once we made it inside, we wandered a short distance. We reached a small junction a short distance in. To the left it looked like some of the shaft had collapsed, and so we picked our way further along the main tunnel (with great care). 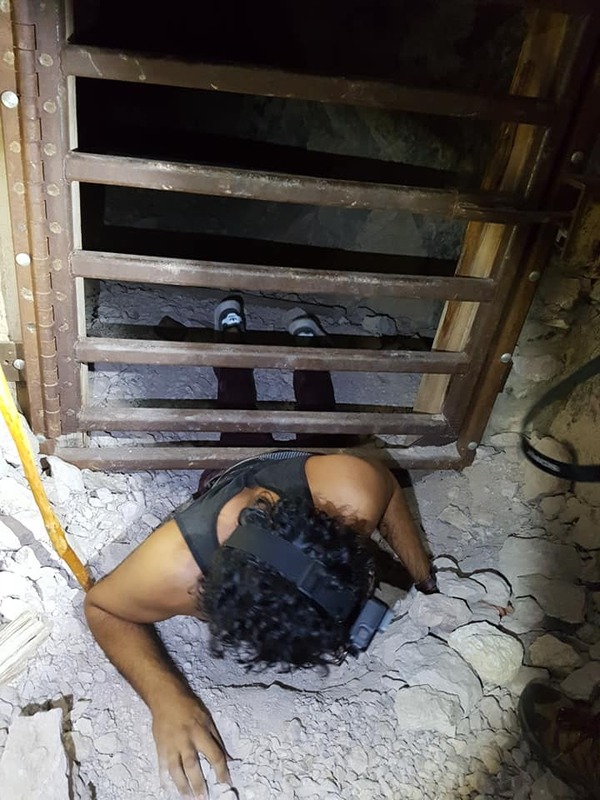 Shortly after this point we discovered that the shaft was home to some bats. We were also now out of earshot of those waiting at the entrance, and the walkie-talkies used by the ghost hunters were no longer getting signal. 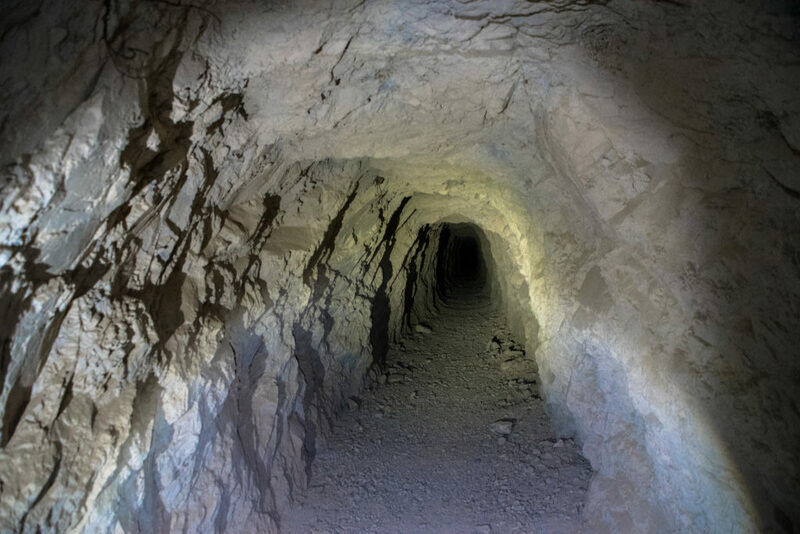 With these factors in mind (and the discovery that some of the mine had collapsed), we decided that it would probably be a good idea to head back and not attempt to play around with the Ouija board as had been considered. We were getting pretty tired at this point, and so the group split off a little. It was a fairly even split of believers/sceptics, and so the sceptics went to go sit on a bench nearby the cars whilst the believers went to go do a final EM reading/try and find some ghosts. During this time I had a half baked attempt at some astrophotography. The camera was in no way set up correctly, and was propped up on debris. I just did a few long exposures and hoped for the best. Surprisingly, this didn’t turn out too badly! While I was taking my photos, the splinter group radioed over to us to ask if one of us was messing with them. We responded that, no we are all sat here fairly quietly. The other group had reportedly heard movement near them, and felt like they were being watched. One of the more dedicated believers insisted that he felt a presence. The sceptics suspected that there may have been coyotes in the area, and so it was decided that we should just call it a night. My Death Valley travelling buddy and I exchanged contact details with our new ghost hunting pals, and headed off back to our hotel for the night. I would say that this little adventure was one of my highlights for the whole Vegas trip. It was born of multiple chance encounters, and was entirely strange. I’m a big fan of seeing the weird and the wonderful of the world, and so it was very much up my street!